When you look into protecting your home from weather and temperatures, you have to consider all of your options. Your windows are where your home loses the most of your conditioned air, in the summer and winter. Unprotected windows leak your air out and let the sun and the wind into your home, further disrupting its natural environment. So to protect your home, you need the best quality window protection. When you are buying an outdoor blinds system in Narre Warren, Elite PVC can custom build a system to fit your needs. Our blinds are strong and made of only high-quality, Australian-made materials. Customers have many different options for guides when choosing a blind system from Elite PVC, from crank-operated to automatic. We make our blinds with strong acrylic, canvas and sunblock mesh. Our automatic blinds can operate with an electric motor or a solar powered motor, which we discreetly install out of sight. Our motorised blind system lasts longer than any other because it operates the right way every time. Our blind system can also be fitted with sun and wind sensors to help protect your home even further. An outdoor blinds system in Narre Warren can help to protect your home against damage from the elements while also helping to provide insulation and protecting your home and windows from the weather. Our blinds will block the sun and the wind, to help your home stay warm in the winter and cool in the summer. For all of your outdoor blind needs, Elite PVC has the option that is right for you. There are many different ways to add value and enjoyment to your yard. Creating a space where you can enjoy company, the outdoors and fresh air is one of the most popular options. Being able to entertain company, read a book, dine al fresco or just enjoy the sunset are all wonderful ways to spend time on your patio. However, while many people enjoy spending time on their patios, frequently bugs, insects and weather can make the patio less enjoyable for many people. No one wants to waste their time outdoors spraying for pests or looking for shade. 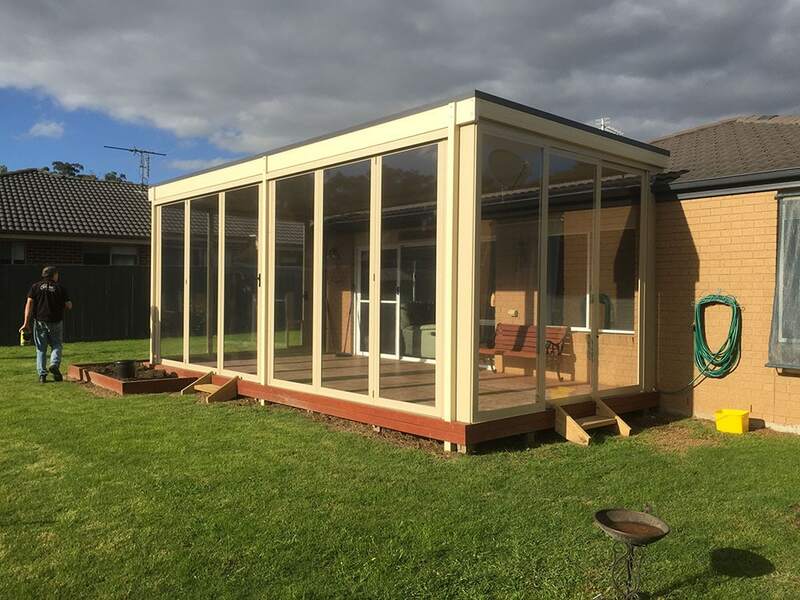 Create a custom space you can enjoy with patio screens in Narre Warren, Melbourne and surrounding areas. A screened-in porch is one of the most simple, easy ways to enjoy your yard more. A screened-in porch keeps out insects and critters, allowing you to relax as you spend time outdoors. Your children can play on the patio in safety and security. Dog and cat doors are easily included into the custom screened porch and allow your pets to play outside with a safe place to go when the weather shifts, to avoid a storm or wind. Homeowners who are interested in the addition of a screened-in porch should consider the addition of a Weatherwall system from PVC. We can build custom patio screens, Narre Warren homeowners will be proud to have in their yards. With a vast range of options for homeowners to choose from, we build exactly the type of screen that you need to protect your home. With custom PVC outdoor blinds, Narre Warren homeowners will find their energy bills dropping no matter the season. Your windows create your biggest leaks of conditioned air. Not only do your windows allow your air conditioned and heated air to slip out of your home, the windows also allow heat from the sun and cold from the wind to come into your home, making your home colder in the winter and warmer in the summer. These factors double the losses for your air conditioner and heaters. To protect their home (and their wallets) homeowners must protect their windows from extreme temperatures. The easiest way to protect your home from the extreme temperatures is with a custom set of PVC outdoor blinds. Narre Warren homes will find that outdoor blinds help to protect their homes more than any other window treatment because they stop the energy leak before it gets to the house. At Elite PVC, we offer a variety of different blinds systems so that our customers can find the best options for their homes. At Elite PVC, we craft our blinds from quality acrylic, canvas or sunblock mesh. We have motorised, crank-operated, spring roller, and fixed guide systems to operate your blinds. Our motorised system helps your blinds to self-adjust and extends the life of your blinds by ensuring that they are adjusted properly every time. Our motorised blinds system is also able to run entirely on solar energy, using the power of the sun to protect your windows from the heat of the day. No matter what your needs are for outdoor blinds, you will find the option to fit them at Elite PVC.